I’ve tried again. I was so hyped after making my first pair of jeans that I wanted to try again, only this time I was going to try to fix those pesky smile lines in the back. And I wanted a pair that was heavily topstitched in a dark indigo denim. The fabric is from my stash – a length of stretch denim blend purchased at a roll end party from Emma One Sock this past year. I got cocky distracted this time around and didn’t measure properly, so this is a rescue post. First, I had to add width. Yup. 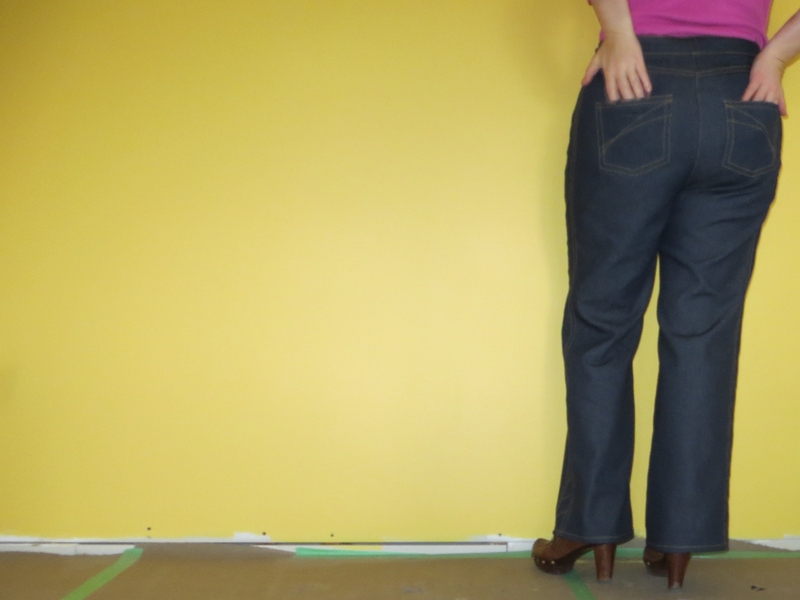 I wanted a pair of jeans that fit a little looser than my previous pair, but I didn’t add the extra inch or two of width when I cut. *headdesk* So, after offering them to DD1 and DD2 (neither of whom were particularly enthused about a new pair of mom-made jeans) I put them aside and went to bed. For the second day. During the night, of course, inspiration arrived and I added a strip about 1 3/8 inch wide down the sides. Piece work was required because I was using scraps. I was pretty dayum pleased with myself for this little bit of ingenious rescuing. Of course it turned the jeans into dress jeans because the legs are wider than I wanted them to be. My DH thinks they’re too wide. I will not pick out all that topstitching, so they’re staying wide. *humph* But let me tell you, I had a saaaagaaaa of fitting frustration that drove me to distraction. They’re still not the way I want them to fit, but they’re pretty good. And I think I’ve finally figured out how to fix those lovely little smile lines. Of course, I learned it too late for this particular pair. But I now know. And they’re too short, damn it. I wonder how stupid they’d look with a hemline add-on… Y’know… maybe something a bit flared and cut on the bias, because that’s all the scraps I have left! LOVE the sides! It’s so funny how a mistake and then the rescue can sometimes really make the garment something unique and special! BRAVO! Perfect save! I love the side detail. Having never made jeans, I am always impressed when someone shares their new pair. I like the side panels too. Great save, I don’t think they’re too short either. I like the look! I like the additions on the sides. You make them look very intersting. And about the length, showing your heels is not a bad thing! I like trousers that I can wear either with flats and heels. They look brilliant! Love the instert & stitching details, & the width seems fine to me. You could always wear slightly lower heels if need be. Well done on your fitting & fingers crossed for third time lucky! I really like the look of the side panel! Great ‘save’ …possibly to be repeated in your charmed 3rd go ’round ? Fantastic save! 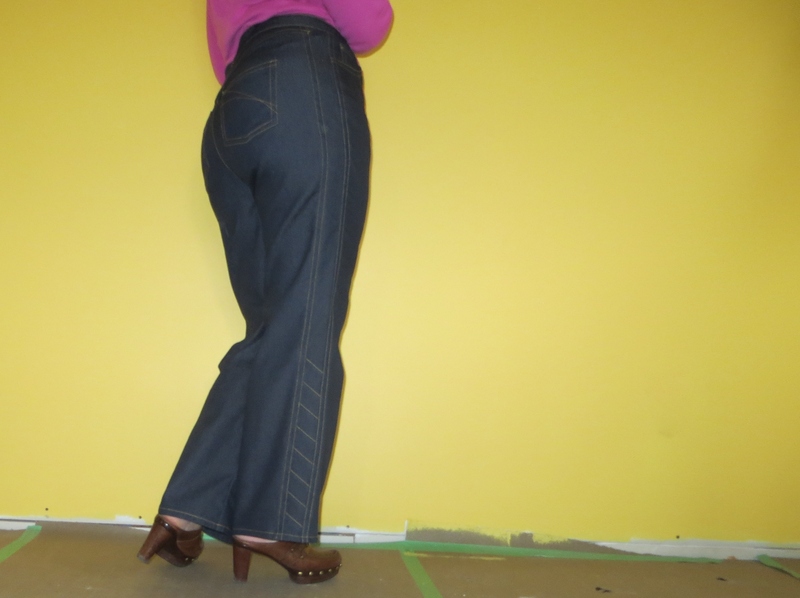 I recall some Burda (magazine) jeans from several years ago with the side panel. I don’t think they are short. I guess you wanted to cover more of your shoes? I am IMPRESSED! I really like the extra width but then I think wide legs and boots just go- and the top stitching at the bottom of the pant is ingenious! 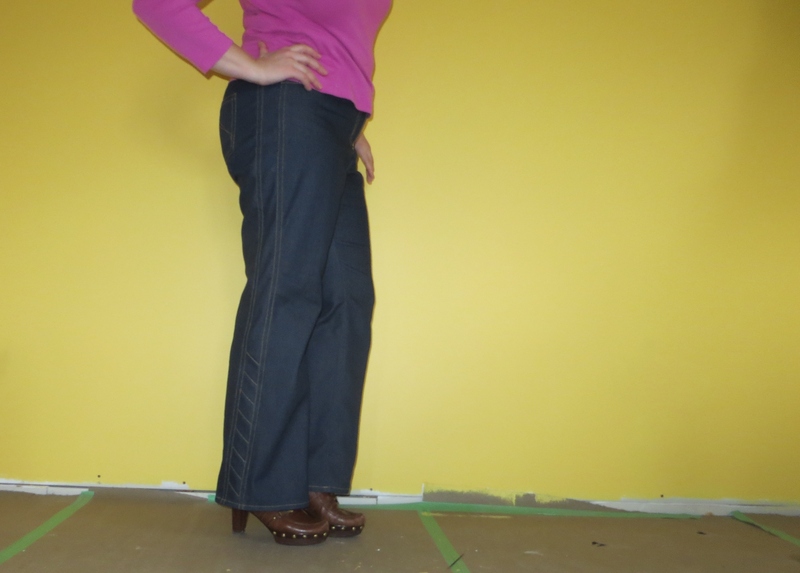 One of these days I will muster up enough courage to make a pair of jeans! Fabulous save! From the photos the extra side seams seem to add a slimming effect. And maybe they’re too short by conventional standards, but I rather like the look in the photos & how it shows off your heels. I don’t know, if it were floor length with heels, given that it’s wider legs it might make the legs look more stumpy than slimming. At least that’s how those floor length wide-legged trousers on less-than-model-tall women look to me, regardless of what the fashion gurus say.